I can only find year old discussions on the value of this. The one I'm looking at has been listed on ebay and CL for well over a month at $2k with no takers. I know with ebay and paypal fees, he is willing to net 1740. I love the theme/movie, but from my research I don't think I should go over 1500. Claims it's been in a home arcade "forever," but that doesn't mean it wasn't routed. Also, does anyone know how many of these were produced? I can't find that data anywhere. This game is tons of fun, can be a keeper in my opinion. I agree with $1,500 for the value of a nice working game, but if you really want it, I don't think $1700 is too bad. No idea on the production. If you love the movie, you will love this pin. Well if it helps at all, I bought one with cosmetic cabinet issues for $1800 and sold it locally for $1900 last year. Yeah they go for $1700 to $1900 quite often. thanks for the quick responses. I absolutely love the movie and do want it, however it's not a pin I just "have to have." I technically should finish putting my JM back together before I buy this one. I fall into the demographic of who would want this one, and I think that is a small group. You have to like the movie, not care that it's not family friendly, and be okay with that 3rd flipper which in my mind takes some time to get used to. Agree on the third flipper, but it is integrated into the game in a nice way, and is a nice mix up from your traditional flipper set up. Wouldn't personally pay more than $1600 unless I was dying to own it... SST isn't worth it. If SSTs are actually selling in the $2000 range, people are passing over better cheaper games to buy it. The last 3 FS threads I see here are $2000 (unsold), $2000 (unsold), and $1650 (sold for $1450). I bought a HUO SST for $1900 and it's worth every penny. It's a Stern Premium in disguse as a cheesy Sega. Medieval Madnesses layout with a badass sci-fi theme. What's not to go bananas over?? What's not to go bananas over?? The dumb 3D cabinet head/translite. The audio. The rules or lack thereof. Middle of the road game. Wouldn't go over $1500, OP. And if all these people can really find SST Sega DMD games for 1400 or 1500, you are missing the boat in the resale market, cause I never see any that cheap. lol, I already saw you mention the MM layout in another thread. It's good to hear this higher sales data, but from my research... I could only find what DefaultGen talked about. Selling for $1450. fun game. Well worth the purchase IMO. The audio. The rules or lack thereof. If you even like the theme a little bit, jump on it. Fun game. I think $1500 is going to be the bottom for a good players machine these days. I saw one for sale in Florida about 6-7 months ago with an asking price of $1300, but haven't seen anything that low since... I've seen a couple of posts in the past where the production was figured at 1500 machines. Cheap fun game, it's going to be staying at our house for awhile! Wow, have you played and listened to the game? Oh wait, you have a Hardbody in your collection (snicker) and you're making fun of a head/translight? I got mine for 1600. Great game. Make sure certain stuff is working. Hey Taxman, Are you going to color SST next? That would be awesome! Are color DMDs compatible in segas? The MPU is a Sega/Stern Whitestar - Same as Monopoly, TSPP and South park. So if those ever get done there is a chance. I was criticizing the shape of the backbox. That 3D dome thing is hideous. And if you're questioning the beauty of HardBody, well. I don't want to of know a red blooded man like that. Now this I agree with. Love hardbody. What r better DMDS under 2k? Can't think of any for that price in California. .. It is now mine. Thanks for the input everyone. Guy said he owned it in his homefor 16+ years and bought it "almost" new from an operator I know. Said he recently replaced the CPU board for $500. Overall it looked great. The playfield was sort of dirty but no damage. The bug count windows were very hazy. I don't think it had been shopped/cleaned since he owned it. I asked to take the glass off, and I had to show him how to do it. When we took the glass off to look underneath, the gunk accumulated on the edge was way worse than my routed JM I got a few months ago. Inside of the cabinet was very clean. The glass had a few more scratches than I would have liked to have seen, but that's an easy fix. I know there is a factory clear coat, so I think some Treasure Cove polish should fix the playfield up nicely. The cabinet had one quarter sized scrape in the paint, but the rest of it looked great. DMD was crisp and bright. Played a couple of balls and everything seemed to work. Moving bug moved very smooth and quietly. I noticed the left flipper would briefly stick every 20 flips or so, but I think that's just because it was dirty. Flippers were strong. He also did confirm what BlueIrocGuy said, only 1500 produced. Guy would not go under $1800, and I was hesitant to offer that. I told him I would think about it. We went back downstairs and started talking to his wife. We made small talk and the conversation somehow turned to how she was having trouble with Google Adwords. Guess what I do for a living? I have all the Google Adwords certs, and am one of the 18 "Partner Ambassadors" in all of USA and Canada selected by Google. I was like, "I can help you with that, ma'am." 2 hours later, he's offering me to trade the pinball to help his wife with her Google/Internet problems... which are plentiful. Worst case is I pay $1000 for the machine and help his wife, best case I pay nothing and his wife becomes a client! Agreed, good for you. And also what the heck are Google Adwords? I guess I could Google it. @Taxman @Chuckwurt It's their advertising platform and how they earn billions of dollars each quarter. Good luck with the SST. If you are a fan of the movie (I pretend only the first one exists) you will love the game. You do have to get use to the extra button. Call-outs are great. Match sequence with brain bug funny. And (like all Sega games) it is a 6 player. I've been playing the pinball arcade digital version. Do you know if that's Casper Van Dien on the custom pinball related callouts or an impostor? I know that's really Michael Ironside, but it sounds like it might have been lifted from the movie. Thats kind of what i figured just never heard the Adwords term before. Anyway, get that thing cleaned and Kill Em All!! Good deal! I'm on my third time owning this game.. Everytime I sell it I immediately regret it -- a good sign it's a true keeper! I won't be selling again. Plus... It has Michael Ironside in it! Also, the #1 concern when buying a SST is the moving hopper bug mech. If that's broken you're kinda screwed as I don't believe there are any replacements out there. PS. This is one of the most difficult pins out there to shop.. Sooo many intricate layers!!! Good luck! I have a friend who did this along with adding a sub and some flasher mods. Needless to say, his SST is insane. I remember reading about one of the mechs being an issue and unobtainium. Of course that was many years ago when replacement parts were rare for anything. What goes wrong? Is it the Hopper bug or Warrior? The Warrior goes back and forth on a big plastic worm gear to block the multiball hole. I wonder what the parts are that you can't get. With 3D printing and other stuff these days I'm sure anything can be fixed. @pinball_customs I forgot I didn't mention that. One of the first things I looked for. It worked perfectly. Very smooth movement and quiet. I'm not looking to strip this one down until I get my JM done. I'll do the best I can without taking anything apart. It played nice the way it is minus the occasional left flipper sticking. That wasn't even really that bad. It would stick for less than a second when it did so. @taxman I thought he was talking about the Warrior. The other one is the pop up brain bug. I didn't test that, but from strategy guides I've read, it's real risky to shoot at for points you get from it. Where is the hopper and what does it do? I remember reading about one of the mechs being an issue and unobtainium. Of course that was many years ago when replacement parts were rare for anything. What goes wrong? The Warrior goes back and forth on a big plastic worm gear to block the multiball hole. I wonder what the parts are that you can't get. The part that is the hardest to find if you need it is the stepper motor that drives the Warrior bug back and forth. I'm not sure if anyone has found a suitable replacement model as the factory stock appears to be gone. Just keep the Warrior bug going back and forth smoothly on the rails and hopefully there shouldn't be any issues! 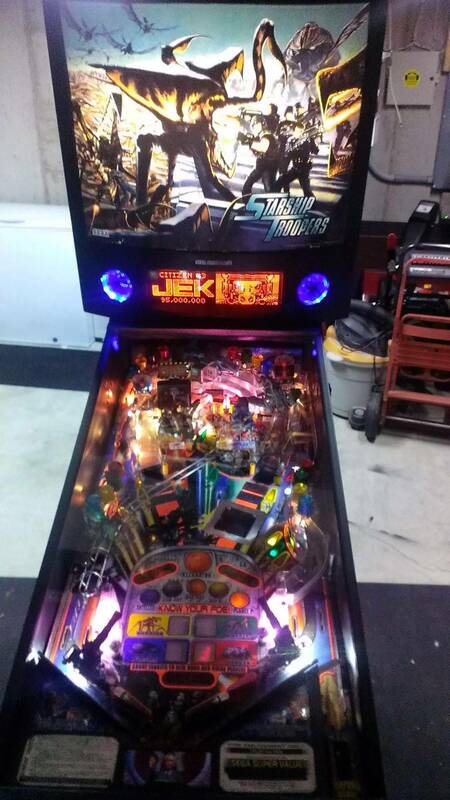 There is an SST pinball club group that has lots of great info and links on speaker upgrades, fixes, mod stuff, etc, ...the usual cool helpful stuff you can find on pinside! The only 2 things that move on the playfield are the Warrior and the Brain Bug. Lots of other fixed cool looking toys on the game that could possibly get modded (lights), but I haven't done anything with mine (yet!). Sorry, yes.. the Warrior bug (not the hopper). The motor on that is NLA. When shopping this game, be EXTREMELY CAREFUL not to bend the track on that assembly. Sold mine for $2000. Fun game, but ultimately I wanted to play something else after having it a year. I paid 2500 a month ago (Canadian). Was shopped real nice. Just plug and play. It's at my neighbours since I ran out of space so only played maybe 10 games so far. I'm liking it!